Today was our last day in Sapporo and our last day in Hokkaido as we were scheduled to fly down to Osaka in the evening. Nevertheless, we still had almost a whole day to enjoy Sapporo as our flight was not scheduled to depart until 6pm. Since the hotel was pretty close to the station we deposited our luggage at reception where it was tagged and put under a big net near the front desk. With our luggage sorted out it was time for breakfast! Kate enjoyed yesterday’s bread so much that we decided to return the Born and Bread bakery at the north entrance to Sapporo station. As we were in no rush to get any particular train today we took our time and ate at the seats inside the bakery. Kate got the same Hokkaido shaped bread she had yesterday while I got melon pan (melon bread) in the same shape. We also got a drink each; strawberry milk for me, and some sort of yoghurt drink for Kate. I'd been wanting to try melon pan for ages and it was definitely interesting! Apparently melon pan are named more for their appearance rather than taste although recently melon has also actually been included in the bread. My bread certainly didn’t look like a melon- it looked like Hokkaido! It looked different to Kate’s plain Hokkaido shaped bread though as it had a hard shell of green sugary substance on the top. In order to live up to the melon pan name the inside was infused/filled with rock melon. It tasted nice although I think I’d like to try the traditional non melon flavoured variety next time. After finishing our bread we went to the ticket office to book our train to the airport. The trip to the airport takes 36 minutes and as it would be an absolute disaster if we missed our plane we reserved the 15:25 train. This got us at the airport at 16:01 and left us with plenty of time before our 6pm departure. 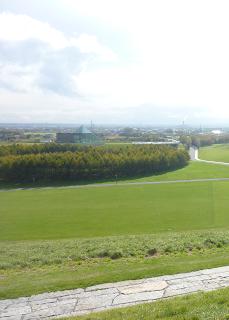 With breakfast and tickets sorted it was time to make another attempt at visiting Moerenuma Park! On our way to the subway we passed by the delicious Santa custard thing that Kate had on the first day here. I really wanted to try it but I was way too full from breakfast! While getting a ticket for the subway I found that we could get a bus/subway combination ticket which saved us a little bit of money. I think this was possible as the buses charged a flat fare of 200 yen (if I recall correctly). 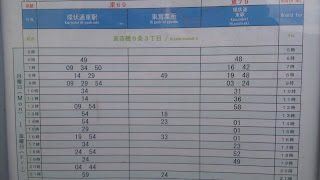 Upon arriving at the Kanjodori-Higashi bus interchange we were once again a bit confused about what bus to get. This was due to the fact that identically numbered buses didn't all terminate at the same location. I actually asked the bus driver if he went to Moerenuma park (with difficulty as you board at the back), and he said "No". Eventually I noticed a sign in Japanese that clarified what stop and number we needed. Our bus arrived a short while later and we hopped on. Along the way we drove past the place where the bus I asked about stopped. It wasn't actually located that far from the park and would not be too much extra effort to walk from there instead. Our bus though dropped us off right outside the park and we alighted after putting our ticket in the ticket box. 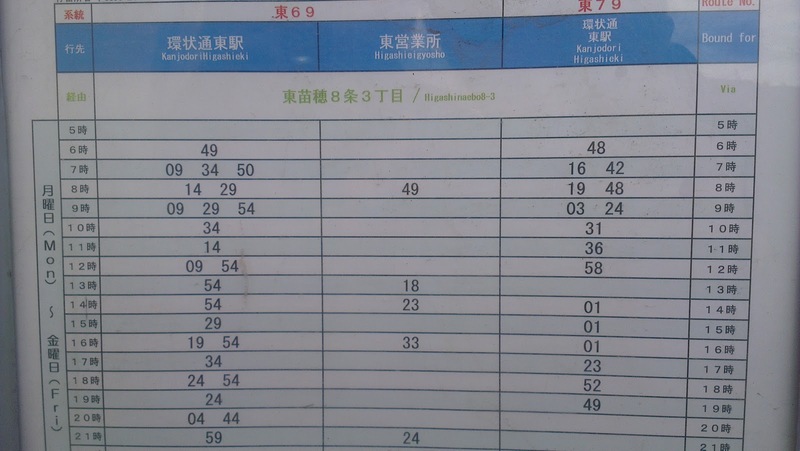 As the buses were pretty infrequent we made sure to snap a picture of the bus timetable. From what we could see at the bus stop the park seemed to be in a bit of an industrial area with few buildings and a run-down kind of feeling. This is not too surprising though as the land where the park now sits was formally a dump. Getting into the main section of the park from the bus stop required a little (500m) walk. Along the way we went under a little bridge that had a lot of autumn leaves on the floor. Since Kate needed to use the toilet we made a slight detour to a building located next to the car parks just before the main part of Moerenuma Koen. Along with restrooms the building also had bicycles you could hire! The lady there was really friendly and asked if we wanted to hire a bike. I did want to hire a bike! Kate was a little unsure but I managed to talk her into it and we hired two of the small basic bikes for two hours. This came to only 200 円 each! The bikes had a basket at the front where we could store everything we were holding except for Kate's umbrella. I asked the lady what we should do with it and she showed us how we could store it by jamming it in behind the seat. I had to fill out a form before we could take the bikes. It had a section for our phone number and I put down our home phone. The lady wanted me to write down my mobile number and I had to explain that it did not work for calls in Japan. Before leaving I also asked what to do when we wanted to get off the bike to climb up the hills and she showed us the stand and said we could just leave it at the bottom. In Japan, no one wears a helmet while riding push bikes and there were none available at the hire shop. So it was a little scary riding around without one. While made sure we were careful it was actually already pretty safe since the park had no traffic and only one small hill you could actually ride up and down. 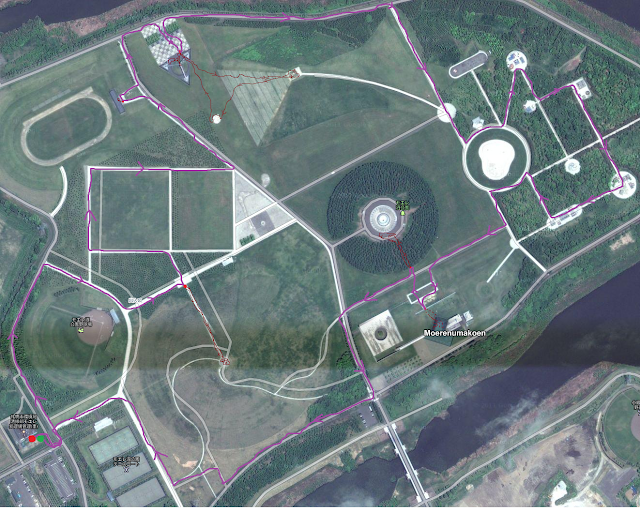 On the right you can see on a satellite photo the route we took around the park marked in purple and brown. The purple lines denote when we were on bikes and the brown lines indicate times that we were walking. So, after getting the bikes we first went over a bridge and turned left into a bitumen road. 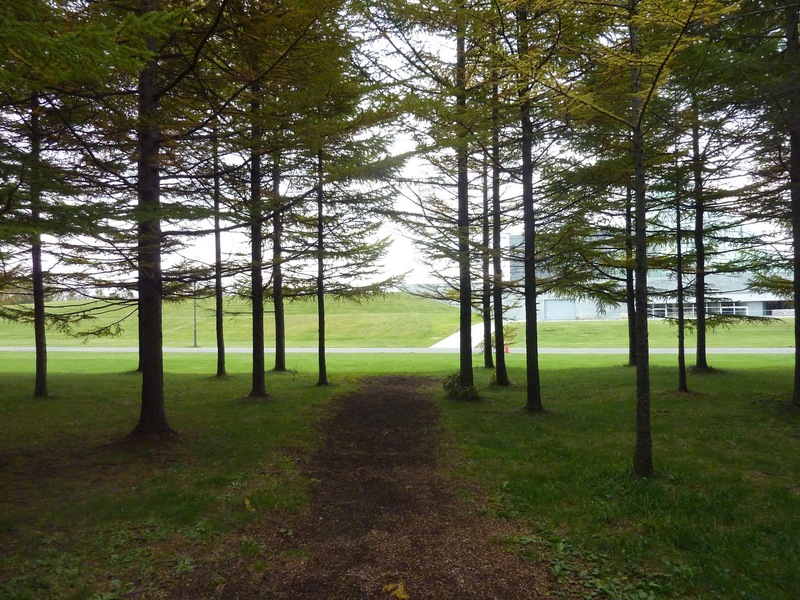 We followed this road around a baseball field before turning right onto a path which we followed around to Mount Moere. 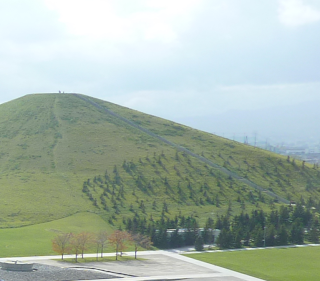 This man made hill is the biggest feature in Moerenuma Park, reaching an impressive height of 62 meters. We left our bikes at the base of a massive set of stairs and began climbing up. Kate was a bit worried about leaving our bikes at the bottom although we could keep an eye on them all the way up. If someone did try and steal our bikes though, we'd probably tumble to our deaths trying to run down the stairs. Although in order to prevent these kinds of death tumbles, the stairs actually have a railing down the middle, and are terraced in such that there is a flat bit after every 20 or so stairs. After an arduous climb we made it to the top and felt a wonderful sense of achievement! The area on top of the hill was pretty small it but was a great vantage point from which to survey the park and surrounding area. There were three other people at the top when we arrived and they looked as tired as we felt. 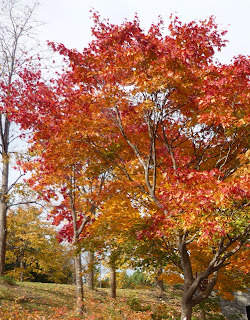 We could also see more people climbing up along a different, curved, path. rectangular hill in the background. Apparently in the winter when Sapporo is covered with snow this hill is a popular location for people to ski and toboggan down. Sounds like heaps of fun to me! The trip back down was a lot less exciting although I slide down the railings for a bit of the way. Upon reaching the bottom we hopped back on our bikes and rode over to another hill. This was the one hill that you could ride up and was rectangularly shaped with a rectangular path leading up to a corner that was the apex of the hill. On the outside edge of the path there was a rock wall that started off with a small drop on each side but turned into a massive drop on the outside edge and a small drop on the inside (path) edge due to the hill. We rode up the straight path to the top of the hill, turned 90 degrees, and rode back down. While path coming down wasn't particularly steep it was long and, as I didn't use the brakes, I picked up quite a bit of speed. I made sure to slow down enough at the end though so I didn't crash. After that bit of excitement we rode over to a building that turned out to be toilets for some sort of sports track. We had a really quick look and then hopped back on our bikes. The next stop was at a place featuring a checker board coloured floor next to a giant triangle shaped metal thing with a little hill under it. This area is known as the Tetra Mound. We got off our bikes and spent some time taking photos of each other posing on top the little hill. After I had my photo taken I thought I'd trying running back down the hill. Even though this hill is quite small it is very steep and on the way down my body got ahead of my legs. I very nearly face planted myself into the hard concrete ground. As this would have resulted in a lot of pain and most likely a trip to the hospital I'd like to strongly advise against running down this hill. 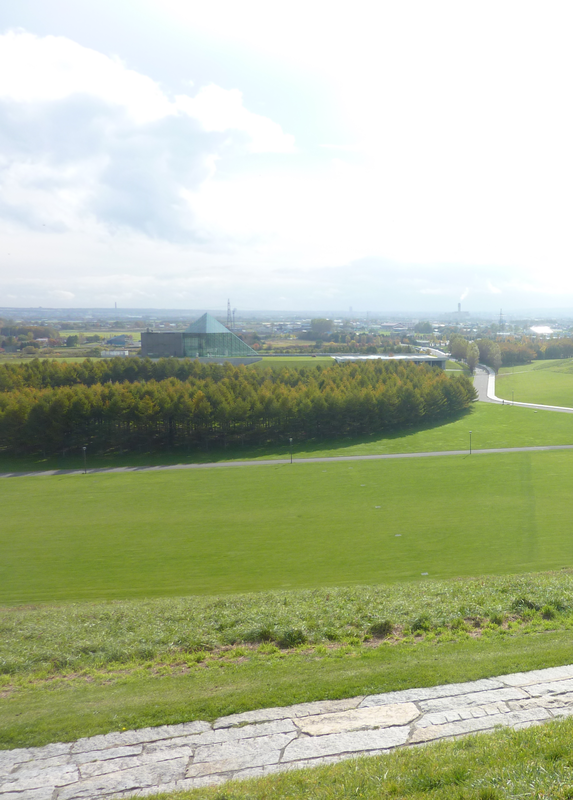 After surviving that potential mishap we left our bikes near the triangle thing and walked over to the nearby Play Mountain which is the second largest man made hill in Moerenuma Park. The side of the hill facing us was shaped like a pyramid with two flat sides that met at a corner. One of the sides resembled an ancient pyramid with terraced steps running along the whole face. We used these steps to walk up to the top of this 30m tall hill. After struggling a little to the top we discovered that the other side looked like a much easier approach as it was smooth like a normal hill and had a nice gentle path leading up from the bottom. On the way back to our bikes we stopped by a weirdly shaped building that turned out to be more toilets. There seemed to be toilets all over the place here! Once we got back to our bikes we rode over to edge of the park and peddled along the outside ring road until it intersected with another path. We followed this back into the park and were led to a path that was a giant circle. In the middle there was a concrete bowl and some metal things. I thought it looked like a fountain but, according to the park's website, this is a Moere Beach and is filled with water for splashing about during the summer months. 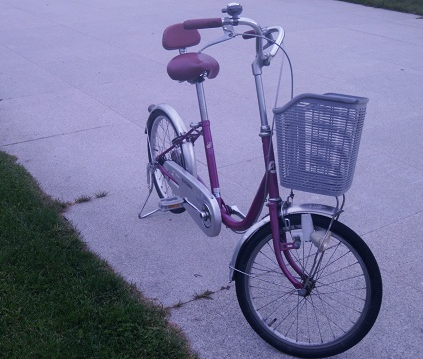 We rode part of the way around the circle path and took the second exit into a forest of cherry trees. Within the trees, and connected by paths were a variety of kids playground equipment- although there were no children or anyone else around while we were there. The glass pyramid of "Hidamari"
After coming out on the other side of the circle path we continued riding to a building that had a giant glass pyramid on it top of it. This building is called "Hidamari" (日だまり) which means "A sunny place". Once we arrived at the building we left our bikes outside and went inside where we found information on the park as well as a shop and a place serving food. While were a little hungry we didn't get anything as none of the food really appealed to us. At Hidamari it was possible to go up inside the pyramid and onto the out roof, which we did in order to get one last view of the park. Kate was trying use to only use stairs today and it was fun zooming past her on the elevator. At the top we saw some Japanese people talking on the phone and waving to someone other people far in the distance, on the other side of the park. Looking at the bus timetable we realised that a bus was coming pretty soon and so it was time to head back. After we got back down to our bikes though there was just one more thing I wanted to quickly look at. On the other side of the path there was a ring of trees that looked interesting. So we rode over to the trees, parked our bikes, and walked though to the centre where we discovered a fountain. This is the "Sea Fountain" which shoots water 25 meters into the air! There was no water when we looked at it though as unfortunately it is only operational between 28 April and 21 October. We missed out by only a week and a half! Once we got back on our bikes we quickly rode back to the bike hire place and found the lady already outside waiting for us! She said he had heard us coming! Since we had only taken one and half to ride around the park and hadn’t felt rushed at any point I think that two hours is a good length of time to hire the bikes for. We left our bikes with the lady, walked to the bus stop and waited a short while for the bus. We had a great time at the park and were really glad we hired the bikes as they were super convenient and very fun to zoom around on. Once we got back to Kanjodori-Higashi I tried to ask the bus driver for a subway transfer ticket to Sapporo. I said something like "札幌まで地下鉄乗り換え切符 お願いします" (Sapporo made chikatetsu norikae kippu onegaishimasu). While he did give us a subway transfer ticket it was the lowest value available and not enough to get to Sapporo station. I tried to ask again but he just started giving us instructions on how to get to the subway station. We ended up just accepting the ticket after listening to his instructions and thanking him. Since we were hungry we went across the road to a Seicomart convenience store where I got some fried chicken in a cup and another delicious cheese ice cream! Kate also got some ice cream (not cheese flavoured though) along with a sandwich and a banana. We ate while walking to the subway station and stopped at some seats just before the ticket gates to finish off our food. Using the combination ticket to get through those first gates at Kanjodori-Higashi station had no issues but, as expected, they caused an error when we tried to use them to exit at Sapporo station! Luckily there was a fare adjustment machine nearby which gave us a card we could use to exit after we paid the fare difference (Which was something like 20円). 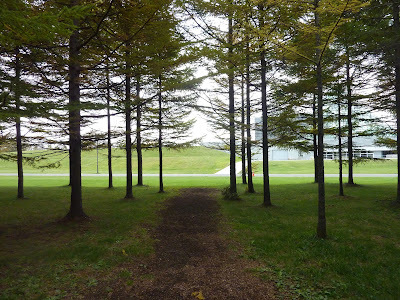 Our next destination was a choice between the Sapporo Ski jump and the 100th Anniversary Memorial Tower. 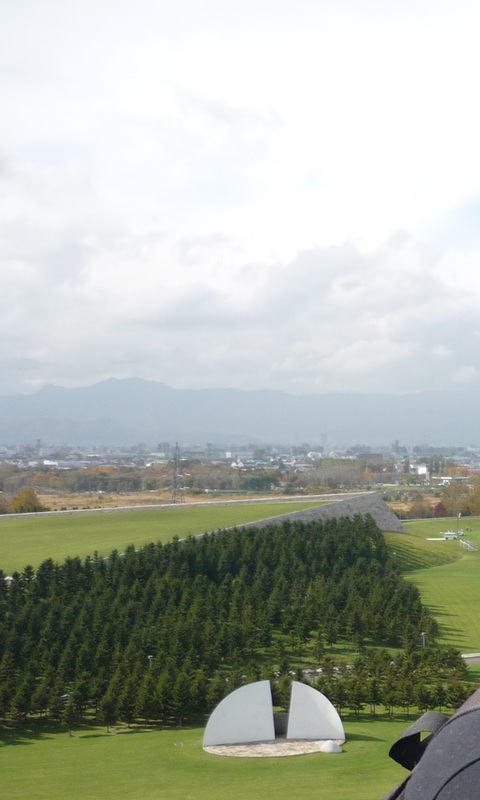 Since we had already seen a view of Sapporo from the mountains we decided upon the tower. We also thought that since we had seen it looming in the distance from so many different locations, we’d be disappointed if we didn’t go visit. To get to the tower we had to get a JR train from Sapporo station to Shinrin-Koen Station (森林公園駅 = forest park station). I used hyperdia lite on my phone to look up the train timetable (as I have been for all of our train trips) and found that the trains were fairly infrequent and one was leaving very soon! As we were unsure what platform the train would be leaving from, and had no time to check, I asked the lady who checked our rail passes when we passed through the ticket gate. She knew right away and we made the train! The station is named after the nearby Nopporo Shinrin Kōen Prefectural Natural Park which is where the tower is located. We could see the tower once we got off the train as it was easily the tallest thing around so we had no trouble working out what direction to walk in! We took a bit of a shortcut through an area that was a bit marshy and had long grass and although the dirt path we followed was dry we decided we'd walk around on the way back. After the shortcut we walked along some small streets before arriving at a main road that climbed up a moderate hill. This road was about 900 meters long and lead straight to the park and tower. All up the walk took about 15 minutes. The 100th anniversary Memorial tower is also known as the Centennial Memorial Tower and was built in 1970 to celebrate the 100th anniversary of the foundation of Sapporo city (1868-1968). The tower is pretty tall reaching a height of 100 meters- one meter for each year I guess. We were excited about going up to the top and took some photos of ourselves trying to imitate the shape of the tower! When we got there we found that the elevator was broken! There were stairs we could use to walk up though, so we took it as a challenge and started spiralling up. Honestly the elevator looked pretty dodgy anyway- the term “death trap” was thrown around a bit. You can imagine our disappointment when we found that the stairs stopped only about a quarter of the way up at the 8th floor- we wanted to go to the top! It looked like the stairs might continue but they were shut off with locked doors- the elevator had an up and down button so it must have went higher at one point. We had a look at the view from the ‘dizzying’ height of 25 meters and climbed back down. We rushed back to the station as the next train was coming soon and we wanted to squeeze in enough time to visit the Hokkaido University, which was located near our hotel. We pretty much ran most of the way back and took the shortcut again- good thing we did too as we made the train by only about 90 seconds. As Kate has been trying to collect hoodies from different universities she wanted to see if she could get one from the Hokkaido University. This would be her third hoodie as so far she has one from Cambridge and one from the University Of Queensland (UQ). We walked from Sapporo station to the university and had a look in the information building near the entrance- it didn't have hoodies but I managed to get a map. I had a look at the map and saw that there was a building marked "Co-op". At UQ this was a bookshop from which one could get hoodies! So we went to have a look and found that it had copying services, books and clothes just like the Co-op at UQ! What's even more surprising is that after some googling I can't find any relationship between the two shops at all. The name seems to just be an amazing coincidence. Inside there were jumpers, caps, shirts but no hoodies! If there was a hoodie sold anywhere it would have been in there so we had tried our best at least and it was still interesting looking at the university and its students. By this time we only had about 25 minutes or so until our train to the airport was scheduled to depart so we rushed back to the hotel to pick up our luggage and arrived at the station with about 10 minutes to spare. Near the north exit of Sapporo station there was a food tourism store that Kate had wanted to look in ever since we arrived in Sapporo. Since there was a little time left I waited outside with the luggage while Kate had a look inside. Seven minutes later she emerged with a box of Shiroi Koibito buscuits and we quickly made our way to the platform and onto the train. 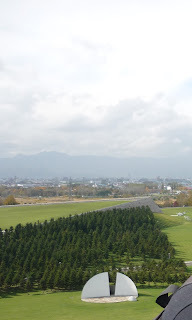 We were headed to New Chitose Airport (新千歳空港 = New + Thousand + year end + sky + port = Shin-Chitose Kūkō) which is the largest airport in Hokkaido and the third busiest in Japan (after Tokyo's Narita and Haneda). After boarding the train we stowed our luggage behind the last row, and made our way down to our designated seats where we were shocked to find that someone was already sitting there! I asked the man if he had the correct seat and he said he had and asked for my ticket. We both compared them and were completely baffled as they looked identical. None of us had any idea what to do and I ended up just sitting next to him and Kate went and sat down at a single seat at the front, after which the man kindly offered to swap with Kate. When the conductor came he checked the man's ticket first, had the situation explained to him, and came over to check our tickets. To our embarrassment the conductor quickly discovered the discrepancy; our ticket had tomorrow’s date on it! We had definitely asked for a ticket for today! The conductor was friendly about it, said it was alright, and sorted it out for us. We got moved to the back of the unreserved section and the man was allowed to stay where he was. Moral of the story is that you should always carefully check the details of tickets you're issued. We definitely should have checked. Once we arrived at the airport we found some scales at a JAL check-in line, weighed our luggage and put as much stuff into our suitcase as we could (20kgs). We also saw some check-in instructions for Peach customers which looked complicated- it told them to go to the arrival lobby for some reason. As we wanted to get rid of our heavy luggage as soon as possible we headed straight for the Jetstar check-in counter. There was an X-Ray security scanning device incorporated into the line which was used to scan our big luggage which was interesting as I've never had that done before. Even with the scanning we managed to check in really quickly as we were the only customers there at the time! Since we still had a fair bit of time until we had to be at the gate for boarding we thought we'd have a look around the airport. We looked at the pre-security side first and discovered a massive amount of souvenir type food stores. I looked like that had every specialty available in Hokkaido for sale including cheesecake, caramel lollies and giant crabs. I was a bit confused about the giant crabs actually. How would you take it on a plane? The best part about all this was that most of the shops were giving away free samples! Walking down the rows of shops and accepting all the samples meant I ended up with a free sample food dinner! There were cheesecakes, scones, biscuits, cake and a whole heap of other delicious sweets. One of the pumpkin scones I had was so delicious that I bought one from the shop. The shop workers looked pretty happy ringing up my one scone and I felt a bit sad for them as there was no one else in the shop and it was a damn fine scone. After the food we went through security and found that there weren’t really many shops on the other side, so we just headed to our gate. Our gate number was "0" which was a bit weird and a little tricky to find- it's actually located on a level above all the other gates. While we were waiting I found a place to charge my phone (in an alcove which looked like it had housed a computer at one stage). When it was time to board the airline staff brought along a portable speaker and microphone to do the announcements, which they did in both Japanese and English. During the flight, most of the announcements were in Japanese with the important ones read in English, by one of the Japanese staff. We also had an update from the pilot which was spoken with an Australian accent. The plane was only half full and was mainly made up of Japanese people along with some Australians. I really hope they're getting enough passengers and the introduction of low cost carries to Japan proves to be successful, as it’s a very cheap way to do long distance travel in Japan. 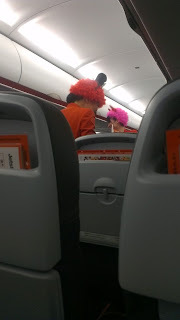 The flight was smooth and uneventful except the flight attendants put on colourful wigs! I guess because it was near Halloween? It was quite funny watching them put them on as they were clearly pretty embarrassed. The airport we were landing at, the Kansai International airport (関西国際空港 = Kansai Kokusai Kūkō) was built in the ocean as there was literally no more room left on land for an airport after the old one reached capacity. A 4km long and 2.5km wide artificial island was created in 30 meters of water in order to house the airport. This required the use of 48,000 tetrahedral concrete blocks and 21 million cubic meters of dirt sourced by excavating three entire mountains. Hang on… If they had to excavate mountains to build the island could they not just have put the airport where the mountains were? Seems to me there'd be some nice flat land which had previously been too hilly to build an airport. That way they wouldn't have to go to the trouble of creating an island as well. The island is an amazing feat of engineering at any rate and was built to withstand both earthquakes and 3m high storm surges from typhoons. There is only one terminal building at the airport which, at 1.7km long, is the largest in the world. The landing itself was a little scary as we were flying (or crashing??! Who knew!) really close to the water for ages with solid land only appearing at the last second. Baggage collection went great! Our bags were the very first two to come out! This happened once before when we flew to London and it's a great feeling. To get to Shin-Osaka we caught the 8:46pm Haruka from the airport which got us in a little under an hour later 21:36pm. The plan was to just sleep at Shin-Osaka tonight and get an early shinkansen tomorrow morning to Okayama. While would have been possible to go all the way tonight we would not have got in to Okayama until at least 11pm and perhaps not at all if our flights were delayed significantly. Once we arrived at Shin-Osaka we booked our morning train (a 6:50am Sakura) and exited via the south exit. Although we could easily see our hotel (the New Osaka Hotel) we had a little trouble finding a path to it- it wasn't too difficult though. The hotel was... not so good. It didn't look all that clean as the furniture and furnishings were very old (as in early '70's)- there was even an old fashioned radio between the beds. The rooms were also really hot when we arrived. We put the air conditioning on but as it was taking a while to start working we opened the window. It was so loud outside though that we had to shut it pretty much straight away. The noise from the window pales in comparison to what came next. What happened was when we tried to go to sleep at around 10:15pm there was a very very loud noise coming from the TV next door. It was clearly set on max and was so loud that we could hear other things vibrating from the noise. It was so loud that I don't think the hotel's thin walls were a significant factor, and realistically speaking, not really the hotel's fault. We tried to use earplugs but they were totally ineffective so we actually had to go down to the front desk to complain! I don't think we've ever complained before and it was really scary. Honestly though it was that or find a new hotel. Thankfully the staff member we talked to was helpful and first tried to call the room several times. This failed though as they didn't answer- the TV was far too loud to hear a mere phone. The man helping us came up to our room with us and bashed on the door for quite a while- still no answer. So he offered to move us to a new room. Right before he came back with new room key the TV was turned off and the noise stopped! We ended up moving anyway as we were already packed up and there was a chance that it could start up again. Our new room was on the same floor but located right at the end of the corridor. Thankfully we didn't have any further noise problems and soon fell asleep. As I keep reading your posts, I notice that you have many interactions with the Japanese people. Do you speak Japanese, or did you learn a lot of it just for this trip? I am curious because I am going there next winter but my Japanese is very simple. Is it very useful to know lots of Japanese to go, or can you survive on just the basics? Wow! Thank you for continuing to read my posts! Thank you so much for the positive feedback too- it really means a lot! As far as language goes, I've been learning Japanese for around 4 years now, but I've still got heaps to go! I didn't really know much at all during my first trip and got around perfectly fine, so you definitely don't need to know much Japanese at all. Plenty of other tourists don't know any and have no issues. A few words would be useful, like thank you (Doumo), sorry/excuse me (sumimasen). If you're Japanese is at the very simple stage then that sounds like more than enough! In the major tourist locations there's plenty of English signs, and staff at major hotels will speak English. Major stations/attractions will have English speaking staff/signs as well. All train station names in Tokyo (and Kyoto, Hiroshima, Osaka etc) are in English and the maps you can get are Japanese on one side, English on the other. All announcements on JR and all but the most obscure private lines are also in English. I've actually noticed that tourists from non English speaking countries (e.g. china) will use simple English to communicate with Japanese people because its the only language they both know. It can be useful to know Japanese if you're going to more rural or less visited locations during later trips. You'd still be perfectly fine to get by though I think. Also, a lot of time I tried to speak in Japanese (for practice) even though the hotel person or whoever probably knew English anyway. I went on a bit there- let me know if that helps or if you want to know more. And a massive thanks once again for the comment! And for reading my posts! Your posts are helping me find certain situations that I should learn helpful phrases for (like getting help at the station, or asking for directions, hotel lingo, etc) so its really been a blast reading these. I hope you have a really fantastic trip next year as well! Yes, when you learn Japanese you don't really get taught travel phrases and often I wonder what a natural way to say something would be. Like should I say "Can I deposit my luggage? ", "Can you look after my luggage", "Can I leave my luggage? ", "Can you hold my luggage?" etc. (I use the first one: 荷物を預けてもいいですか/nimotsu wo azukete mo ii desu ka). Thank you so much again for reading and leaving a comment!